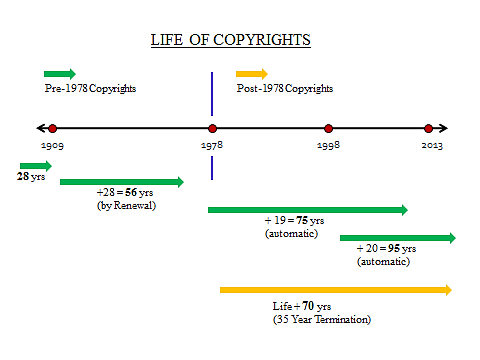 The life of a U.S. copyright has changed considerably throughout the last 100 years, and many people are still confused about the rules, which were last changed in 1998. This article is my attempt to briefly cover the history and simplify the explanation and terms along with a snapshot of the timing through an illustration. This article won’t cover every exception, (including works made for hire), but it will provide the standard lengths of copyright for normal songs which are not created as “works for hire”. (I will cover the definition of “works for hire” in an upcoming article). Prior to the U.S. Copyright Act of 1909, the term of a copyright was 28 years. That was it. The 1909 Act extended the term by adding another 28 years, called a “Renewal”, as long as the appropriate owner filed a valid renewal application in a timely manner. If the renewal wasn’t filed properly in the 28th year, the copyright went into the public domain. (One famous case of the renewal not being filed was for the classic movie “It’s A Wonderful Life”, which officially went into the public domain in 1974, and is why the movie was shown countless times on various stations until certain owners asserted other rights of protection, but that’s another story). The Copyright Act of 1976 (effective January 1, 1978) changed the terms again by adding an additional 19 years to those copyrights already in their first or second term as of that date (which we’ll call “pre 78” copyrights), and gave them a life of 75 years total. No additional registration was necessary in order to qualify for this 19 year extension. At that same time, the law stated that any copyrights effective after 1978 (what we will call “post 78” copyrights) would go by a different set of rules. Those rules said the life of the copyright will be 50 years after the death of the last surviving author. And further, no additional registrations or renewals would be necessary for these “post 78” copyrights to extend for their full life. And those are the rules today. Songs registered or first published after 1978 continue under copyright protection for the life of the last surviving author plus 70 years. Non work-for-hire copyrights published or registered earlier than 1978 are protected for a total of 95 years from the date of their first publication or copyright registration, whichever occurs earlier. So when you are looking at using an old song, check the copyright date and add 95 years before you assume it is public domain. And if you are a writer, this gives an entirely new motivation to helping young writers by co-writing with them. Their youth can work to your (or your heir’s) advantage.